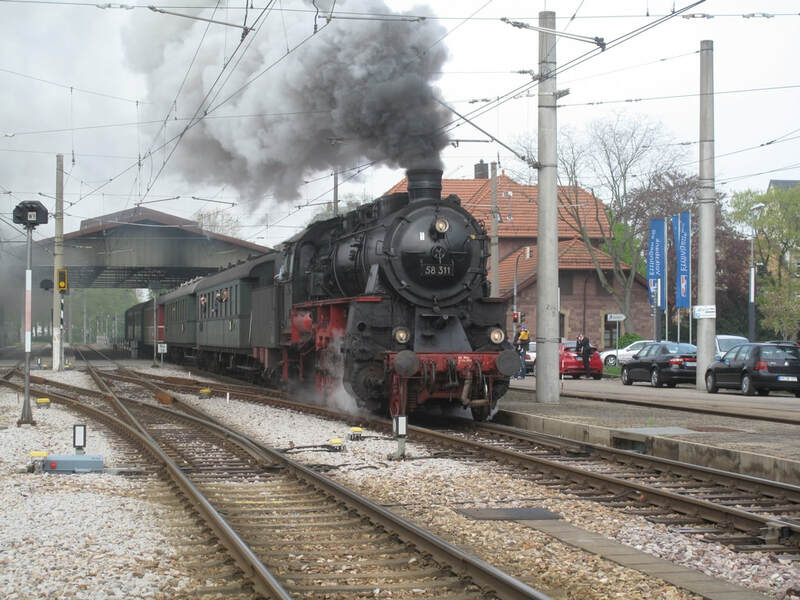 The 1st May public holiday fell mid week this year so we found ourselves with an unusual Tuesday departure for a very brief trip to Baden-Württemberg. 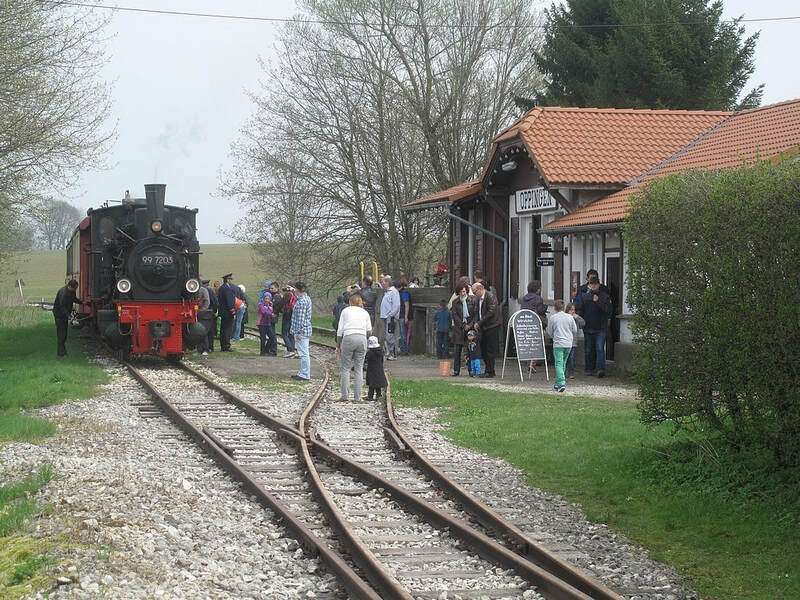 The main objectives were the Ettlingen West - Ettlingen Stadt connection, freight only apart from a few steam excursions each year, and the Amstetten - Oppingen narrow gauge preserved line. Oppingen had been an irritant for quite a while, its infrequent operating days never seeming to coincide with having time to go there! Work until midday then a hasty lunch prior to the 13:12 Arrivamobile to the town centre with onward connection on a 33A to the station. A clean and punctual (honestly) pair of ATW 158s turned up as 13:53 to Birmingham Irrational. We paused briefly at New Street to view the underwhelming new 'half a concourse' opened yesterday. Perhaps it will be better when a) it's finished off and b) the other half is there. We did like the 'green wall' of plants beside the walkway leading to the Bull Ring and Moor St.
On to Irrational on an LM Desiro, for a 2 hour fester enlivened by a pint of very expensive Broadside at airside 'Spoon's and prolonged by a 25 minute late departure. However we're descending towards Stuttgart as I'm typing this and the co-pilot has just informed us that we've regained the lost time. Well pedalled everyone. The haulage is a Bombadier Dash-8 400 or some such. We landed more or less on time at 20:15 and after a bus transfer, a few scanning problems with our passports, comfort stop and ticket purchase including tomorrow's BWticket, we still made the 20:38 S-bahn with ease. To Vaihingen on that, then U1 to Marienplatz for the Ibis. A pre-bank holiday shindig was on in the Platz, with rock-ish band and beer stalls (all Dinkelacker aligned). Very poorly attended due to the sporadic drizzle so we were able to enjoy a Sanvald weizen in comparative peace before retiring. Freight track was of course duly done from Ettlingen West to Ettlingen Erbprinz and we decamped at E-Stadt which proved a suitable spot to phot a very claggy departure by the 58. Back to Karlsruhe on the tram. Rothaus Tannen Z„pfle was purchased for celebratory consumption on 11:19 RE back to Stuttgart, more dostos, with unspecified but presumably 146 haulage. Celebratory refreshments were topped up with a M„rzen from Schwaben Br„u then we were away at 13:17 on a 426 to Amstetten, disappointingly working an RE. 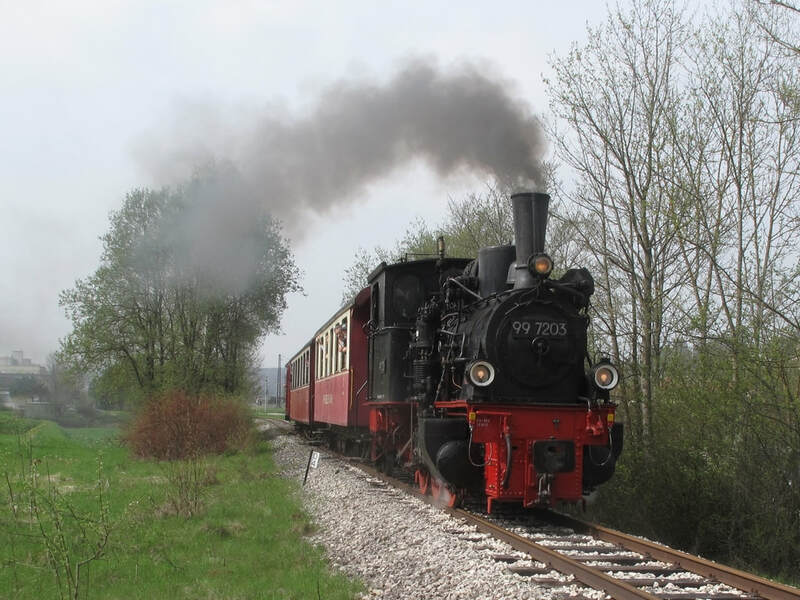 Amstetten was reached on time - only a 9 minute connection to the narrow gauge but I bet they'd have held it anyway. It's a fine and to my surprise quite scenic line. Quite a lot of work on track replacement seemed to have gone on over the winter. Haulage was 1904-built Borsig 0-6-0T 99 7203, with two coaches and a baggage van. Oppingen station is in the back of nowhere but is well organised with swings and slides for children, a buffet with Kaiser beers (not sampled - phots took precedence) and a wurst stall (ditto). 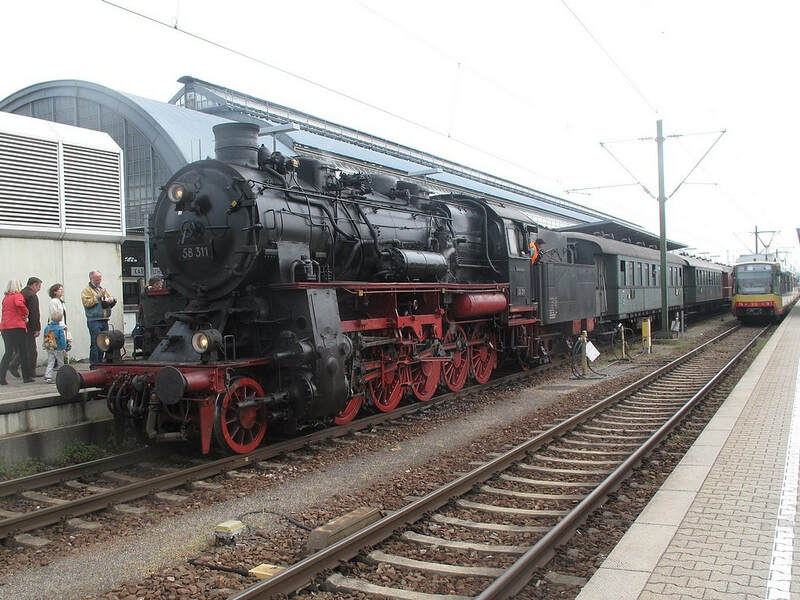 Back at Amstetten there was time for a short walk to phot the 16:10 departure on the narrow gauge, before the 146-powered 16:27 RE to Mosbach-Neckarelz, which we took as far as Bad Cannstatt. S-bahn time then, starting with an S1 to B”blingen. This got to 4 late for a 5 minute connection but picked up a couple of minutes, easily making the cross platform connection at the much rebuilt B”blingen. The last rail objective was the S60, now reopened through to Renningen on the Weil der Stadt branch. Very much routine, even the new (to me) bit north/west of Maichingen. Physcon 1 approaching Renningen but to my great delight we ended up in P2 of the rebuilt Renningen, which is shared with the S6 Weil der Stadt service. It looks as if P1 is used by S60s going beyond Renningen. B”blingen-Renningen shuttles stable in a siding between the Weil der Stadt lines just west of the station. It looks also as if in the recent remodelling the WdS lines have been slewed so that the west bound line is now on the former eastbound alignment. We changed to an eastbound S6 which went from P2 so as I've been to W.d.S. before, inked-in-ness was declared. A quick change to a Bietigheim-bound S-bahn at Zuffenhausen, then to bus 422 at Ludwigsburg and finally Shanks's Pony at Arsenalplatz, took us to the admirable Rossknecht. It turned out that my attempt to reserve a table had been successful despite all evidence to the contrary - so the day had worked out to perfection. Salmon for H and roast pork for me were accompanied by the superb 6.7% Maibock. Well, it was 1st May - would have been rude not to! Back by foot and 422 to Ludwigsburg, RE to Stuttgart Hbf where the usual Internet caf‚ provided check-in facilities for tomorrow's flight home, and finally U14 to Marienplatz for the Ibis. Little of rail interest, with a late breakfast taken at a caf‚ across the square followed by a walk up to Stadtmitte for the 11:17 S-bahn to the airport. At the time of typing our Dash-8 is just about to start the descent towards BHX. Immigration was commendably quick at BHX where the amalgamation of Ts 1 and 2 and the arrival of a certain low cost airline has led to some pretty awful queues in the past (perhaps it still does at busy times - this was a quiet midweek afternoon). At any rate we were quickly over to Irrational for the 15:08 ATW kart to Telford and a bus home. A short trip, but it's always satisfying to be able to ink in these 'occasional' lines which so often aren't running at times when there's a longer visit in prospect. Reopenings and a few new openings continue and it wasn't long before I set off to tidy up a few more things in Germany that hadn't quite fitted with earlier plans.